The only sport I excelled at in high school was chorus. Heavily involved in PEMA, the Pennsylvania Music Educators Association, I practiced all year for the annual auditions to advance through various levels of choral programs. Each program featured harder music to learn with fewer open seats. The first level was County Chorus, and then Districts, Regionals, and States. My cousin Carmen and I attended the same high school, and both of us had advanced to Regional Chorus. Hosted each year at various Pennsylvania high schools, we traveled by bus 109 miles north to Oil City High School. We were to stay at a host family’s house for the weekend, so that we could travel back and forth from rehearsals and then to the Regional Chorus concert finale. We are driving. Our host mother grasps the steering wheel with thin hands, her white shoulder-length bob and matching silk tunic a ghostly sheen amidst the black interior. The woman tells us her and her husband own a funeral home together, and that he will join us later for dinner. Carmen and I sit together in the backseat in silence, nodding. The luxury SUV swerves with grace. “Luxury” is a distant term from where Carmen and I live, a rural town with less than 800 people. I shift my attention to the unfamiliar landscape reaching through the tinted window. The middle of February and still no snow, the grass remains bare but frozen. Trees speak with muted branches. The earth a crystalline vortex, and I, barely seventeen, in the middle of it, seated in warm leather. Living with host families during these choral programs was always a highlight for me. I did, and still, have an obsession with people watching, and staying in someone’s home satisfied this. My curiosity also lead me to what I call house creeping, or, taking walks in affluent neighborhoods to admire stranger’s houses: their window decor, ornate door archways. I think of the Chicago Art Institute Thorne Miniatures Room, where I spend hours peering into tiny glass boxes of mini-kitchens, mini-parlor rooms, mini-bedrooms. Imagining and re-imagining people in those time periods. Who were you, I ask the mini-furniture, as it stares back, silent, the only spirits seen that remain of the once-lived. “At times,” John Ashbery writes, “The objects you have been contemplating take on a life of their own in and for themselves.” And T.S. Eliot, who writes, “It is only in the world of objects that we have time and space and selves.” Staying with host families was like stepping into one of these boxes. I could live in someone else’s intimate space, use their personal objects, and even sleep in their bed. I got to see a glimpse into their lives, be their lives, just for a moment. To be on the other side of the box, peering out. We walk in the kitchen from the front door while our host mother talks to us about dinner. Make yourselves at home. I stocked the fridge before you came. I didn’t know what you liked so there should be an assortment of things. She barely finishes her sentence when I walk to the stainless steel fridge. I open the left side, assuming it is the freezer, and see vanilla bean ice cream. Guessing correctly where the silverware drawer is, I grab a spoon. Asking for a bowl, I tear open the lid and start scooping heaps of white coldness. I look up. Carmen is staring at me with a horrified what-are-you-doing face. Our bags have not even left the foyer. My shoulders shrug. I respond to her berated look while I open the freezer again to put the ice cream away. What? She said ‘make yourself at home.’ Well, I’m making myself at home. Walking into the dining room on soft, white carpet, I see chinaware cabinets in two far corners. A grandiose table is in the middle of the room, complete with a bowl holding what looks like real fruit and a teardrop chandelier hovering above. It is a Home and Garden magazine feature spread. Stepping forward towards the living room, I see two dark, leather couches lined with bright, circular golden tacks. A matching plush chair sits statuesquely to the left of the couches. Luscious green plants surround the furniture; tall and skinny with fern-like leaves, short and stocky with coarse leaves, fill the empty space. Just then, I see the television. It is almost the size of the opposite wall, flat and shiny. I have never seen such a huge flat-screen television. This is 2006. Flat screens are just beginning to happen. I sit, or rather, lounge, on the leather couch facing the television. I find the remote placed in what looks like a battery charger. Picking it up, I turn on the television and see the TV menu guide light up on the remote. In a tiny square, I can scroll down and see television shows available right now. All the letters are so tiny that the show names are barely visible, but yet the simple fact it exists is the reason why it matters so much. Since noticing the house is oddly chilly, I throw on the nearest cashmere blanket (Actually, I have no idea if it was a cashmere blanket, I like to believe it was). The coffee table is lacquer, smooth and shiny–brilliant wood. I rest my bowl filled to the brim with ice cream on a stack of magazines, for fear of ruining the wood of the coffee table. A door in the adjacent hallway swings open. A man appears. He is thin, his hair is white and thinning, his hands skinny and wrinkled. He has an apron on–not a kitchen apron, but more simple, like what a surgeon would wear to an operation. The apron is pale green, with cream-colored strings tied behind his back and draped around his neck. There are two small pockets in front at his waist. One is filled with numerous silver tools, the kinds of tools found in dentist offices. He stands there for a moment, contemplating and staring ahead. I look at him, startled. I am out of his sightline; my body is still and lying straight on the couch. He doesn’t look in my direction. Instead, he turns the opposite way and disappears down the hallway. I turn my eyes back to the television. I start scooping heaps of ice cream into my mouth. My eyes then widen. I know what he was doing. Dead bodies in the basement. I’d like to think from this point on, I didn’t think about the fact the man who had just come from the basement was the same man who sat across from me at the dinner table that night. Hands that had just cut and drained the blood and fluids of cadavers were a mere foot away from me delicately cutting pieces of chicken in thin slices. The face of the man nor my feelings about this man at the dinner table I do not remember. I simply tried to not look out of place, like knowing which fork I should have used or my hesitated fingers as water was served in wine glasses (at my parent’s house with five children, glass cups were a no, plastic, a yes). I do remember dinner was full of conversation that gathered laughs, stories of family, their children, and the more recent childhoods of Carmen and I.
Recalling this memory (or partial-memory) makes me think of this man who came from the basement that night as simply a man: a nice man (no bizarre behavior came from him, that I would remember), a family man, a husband and a father. A man, who stabbed the last piece of meat on his fork, lifted it to his mouth, and ate. The closest connection to death and the man I witnessed. After saying good night to our host parents after dinner, we ascend up the stairs to the second floor. The couple’s bedroom is on the first floor, leaving the upstairs space to Carmen and I. Night has settled heavy outside the windows. The house is quiet and I notice even more now the coldness, even though warm air supposedly rises. I begin to think about what I saw earlier–the man, the apron, the tools jutting out of the pocket. There is a heaviness evoked in the air, as if the house itself doesn’t want to tell me the man’s secret, as if the objects had their own spirit to them, their own weight, as if they are too perfect. —You know why it’s cold right. I state this like an obvious fact. Carmen asks this casually, unpacking her bag. She has this oh-what-is-your-ridiculous-theory face on. Yet she doesn’t argue the fact the house is quite chilly for being February outside. —Because there are dead bodies in the basement. A hint of paranoia rises in my throat, steadies itself. I explain to her the connection between the coldness, the man, and the funeral home, the husband bursting forth out of the basement. —Dead bodies. He was working on them in the basement. I bet they are down there now, just lying there, dead. I make sure to emphasize the word dead. —That’s why the house is so cold. There are ghosts in here. I say this last part slowly, almost a whisper. She still isn’t impressed. I want to go on convincing her when I notice there isn’t an overhead light. Resting on the bedside table, a lamp is turned on. I am holding my cell phone and need an outlet to charge it. I keep looking around for an outlet but see nothing. —No matter what happens, the lamp has to stay on. I reiterate this clearly while I begin looking for an outlet for my phone. —I am afraid of the dark, and even more afraid of ghosts. Still looking for an outlet, searching behind a dresser, a chair . . .
—There isn’t an overhead light, do you see? None. Let’s leave the door open slightly for a makeshift nightlight. Carmen still is unpacking, nodding but doesn’t say a word. I finally see an outlet. Taking my one free hand, I pull a black cord from one of the electrical spaces to make room for my oversized charger. The room goes black. I panic, crouching down to the floor to grab the cord I just pulled to try and put it back, the cord that led to the lamp that led to the light. I cannot see anything. Carmen crouches down too, apparent by her voice invisibly floating near mine, asking where the outlet is. My voice is loud, slicing through the darkness. —I just wanted to plug in my phone charger, and I didn’t realize what the cord went to, then the lamp went out, and there are ghosts in this house . . .
—Give me the charger and move away from the outlet! There is a severity to her voice. I have no choice but to follow. I find her hands and pass the charger to her. The light comes on. Carmen intently stares at me. She leaves the room for the bathroom down the hallway. 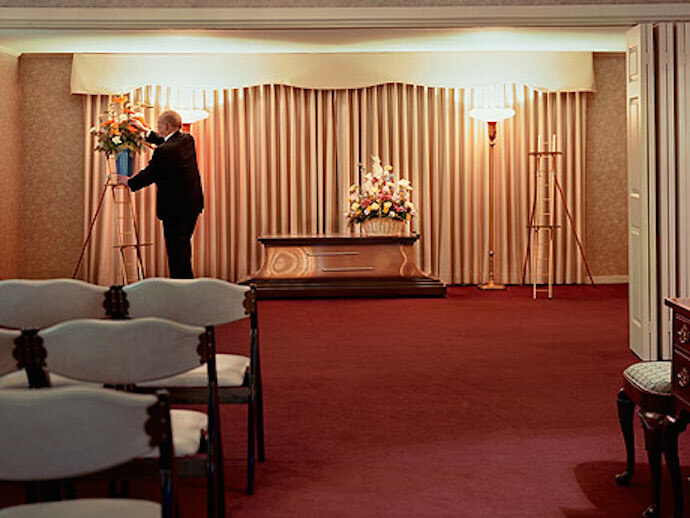 In 2006, there were 21,088 funeral homes according to the National Directory of Morticians. 1,763 of them were found in Pennsylvania. That weekend in February, one of them was next door from me. I watched a YouTube video featuring an embalmer in a funeral home taking the viewer through the steps of embalming. She claims embalming is closure for people, and that to her it’s a way to demystify the phobia of death so many have. The embalmer states her job is thrilling, just her and the bodies all day. I’m all by myself, just me and my buddies, guests, as I like to call them, she says, snapping her gloves on. I’ve never been to a funeral home. In fact, I’ve never even been to a funeral, or even witness a person die. I’ve never seen a naked corpse up close. So to witness on video a live person slice open an artery of a real, pale, discolored corpse and insert a tube for formaldehyde to flow through its veins (should I say, his veins?) was quite horrifying, but also irrationally fascinating, to see a face, skin, feet as simply this empty shell.
. She goes on to say she completely believes in spirits, that a lot of embalmers have experienced spiritual presences. Which I, myself, have never had, much to my disappointment, she tells the camera while wheeling a table with the corpse under a white sheet to join the other corpses under white sheets. Did the man witness spirits in his house or believe in spirits? Did the man or woman even notice their house was perhaps colder than usual? They never mentioned it once. Perhaps the couple who owned the funeral home was simply used to the cold, told themselves spirits didn’t exist, simply locked this secret away in the basement. Just who were the guests that weekend? The paranoia once in my throat now spreads over me like thick smog. I look at my reflection in the window across the bed. The window is black except for my face staring back at me, my long brown hair in a ponytail, my features small. I think about the dead bodies in the basement, bodies stretched out, naked. I look at my body, the thinness of it, my arms hanging limp at my sides, my hands now touching my face, the bones beneath my eyes. The house, large and cold, is a perfect place to live in comfortably for a dead person. I continue to stare at myself. The husband could have transformed it into his own private morgue, the walls filled with drawers filled with bodies. I imagine the basement room: steel hidden containers with hinged latches, hard metal examining tables in the middle of the room. Tools hanging like ornaments against a far wall. I imagine them walking around, their thick, bloated feet thudding on cement floor, some lounging on their metal tables. How could anyone live in a house with corpses and be okay with it? Who were these people? Just then Carmen walks in the door, placing her bathroom belongings on the bed. It is my turn for the bathroom. I hesitate, not wanting to leave the room by myself. I peer out the door then run down the hall on tiptoes not to wake the couple downstairs, not to let anyone know I am running because of ghosts. I reach the bathroom and quickly lock the door. I stare at myself in the mirror, lay my hands against the marble sink surface that’s cold to the touch. Coldness from the tile floor embodies my bare feet. I have no idea where the ghosts are now. It is cold everywhere. I can’t get the dead bodies out of my mind. What was her husband doing down there earlier? Was he really with dead bodies? What do the bodies look like? Why? After finishing in the bathroom, I run on my tiptoes back down the hallway and close the bedroom door. My makeshift nightlight suggestion is overruled. I make Carmen wait until she and I are both under the blanket before she turns off the lamp, she being the closest one to the bedside table. I prepare myself. Good night, Carmen whispers, as she shifts her body away from me. My breath slows, deepens, and suddenly, the light is gone. The objects in the bedroom start to emit a strange hue that makes them feel almost alive, a buzzing of low light. Spirits of dead bodies are coming up the stairs, slowly making their way to the bedroom one by one. More and more bodies enter the room, one so close I can feel its coldness through the blanket, an alarming, saturated cold that fills my stretched-out limbs. The cold paralyzes me. —We are the once-lived. Who were you? I want to move my tongue, my mouth, but don’t. Hues from objects begin to expand into each other, into the spirits themselves. They speak again; mimic in unison. Who were you, who were you, whisper throughout the room, consuming my ears. An armoire in front of the bed bursts open, releasing a shape-shifting creature of my deepest fear. But what if my deepest fear can’t be conjured in a creature? How does one conjure nothingness? What creature comes from being alone? Josalyn Knapic lives in Chicago, IL. She is editor of South Loop Review and the assistant fiction editor of Another Chicago Magazine. Her writing has been featured in DIAGRAM, South Loop Review, and other venues. Contact her at josalynknapic@gmail.com.